"Good morning Jami. It was nice to speak with you as well yesterday. I spoke with one of my customers in St. Clair. He spoke very highly of your company. He said he toured your facility and is very impressed with your workmanship. I'm looking forward to meeting you after the new year and seeing your facility." 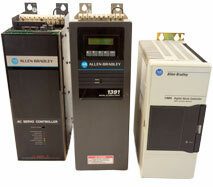 Need an Allen Bradley Drive Quickly? We Deliver. If you are looking to purchase an Allen Bradley drive, then look no further for high quality Allen Bradley automation part replacement. We specialize in remanufacturing drives and pricing them to be an affordable replacement choice. Exchange your drive with one of ours to eliminate downtime! Browse our inventory below to find the Allen Bradley drive you need. Or, get help now by requesting a free quote , or calling one of our trained technicians at 989-922-0043.